Replete with a hint of modernity and dash of tradition, today's feature property is a gorgeous juxtaposition of unique architectural elements, as well as wisdom of heritage and style. 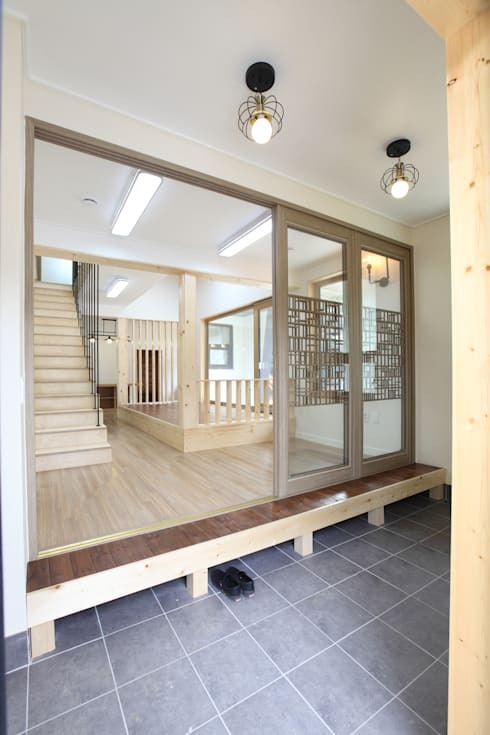 Situated in South Korea, this dwelling is a truly cosy and well designed home. Brought to us by homestyletoto, this abode is recognised for its impressive contemporary construction, while also paying homage to tradition and history. Boasting creative interior spaces that emphasise simplicity and liveability, this residence is unlike many other modern houses. House Nanyuan, as it is known, is reminiscent of an ark—with the sense that those who reside within are protected from exterior elements, with a family-friendly ambience and atmosphere. 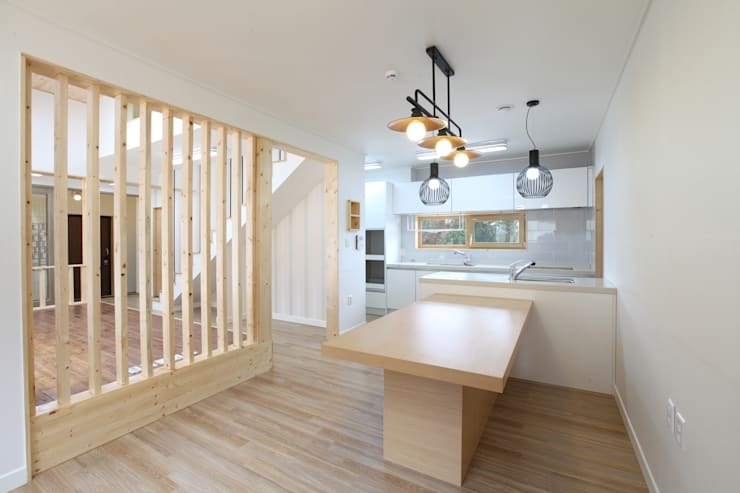 If you would like to check out the inside of this intriguing and welcoming home, take a peek at the images below, and perhaps gain a little inspiration for your own renovation or refurbishment! Rising from the ground and acting as an impressive focal point within its surrounding landscape, this dwelling ticks all the necessary design boxes. From this vantage we are given an immediate sense of the home's traditional aspects. It features a pitched roof, rectangular shape, and boasts a neat front portico. However, it is the finer contemporary touches that make this home stand out from the rest. At the rear of the home we are able to see where the architects have included a timber-panelled feature. This creates a beautiful contrast against the all-white facade, and ensures the ark-like aesthetic. Still under construction, the garden will make the perfect addition to this residence, providing a huge space for outdoor entertaining, ideal for family-friendly fun! Entering the home we are immediately presented with a sense of heritage and history. 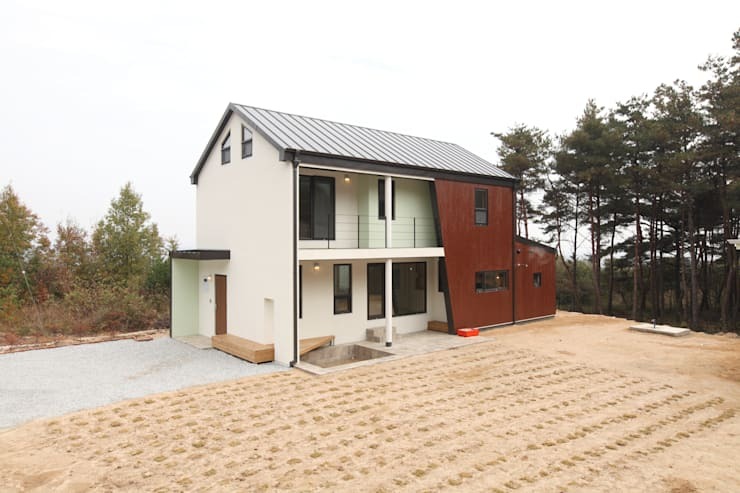 The timber interior cladding offers warmth, while the house is raised slightly to keep the interior well ventilated and climatically consistent year round. Well illuminated and overflowing with streams of bright natural light, this room is an incredibly open and welcoming entrance. Sliding glass doors have been covered with a pattered motif, which resembles many traditional wood and paper walls. This is yet another way the designers have incorporated traditional Korean elements, in a contemporary and modern setting. If you are considering building or renovating your home, you can find many architects and professionals via the homify website. Make sure you get the expert advice you need, to design and decorate your ideal dream home! As we move further inside the home, the use of timber as an internal decorative material is seen in full. Employed as cladding for the ceiling, staircase, as well as the floor and room divider, the essence of the space is warm and inviting. Additionally, the raised ceiling emphasises a sense of spaciousness, creating an open aura and ambience. To achieve an open-plan living area, while still separating the different domestic zones, contrasting timber tones have been implemented. In order to keep the internal spaces open and airy, wall dividers have been used in place of solid walls. This is evident within the kitchen/dining and living room. A timber room separator brings the two spaces together, while still offering privacy and segregation between the rooms. The kitchen is minimalist and perfunctory, but injects style in the form of simplicity. Attached to the central cupboard and joinery a timber veneer dining table protrudes. This creates a family friendly space, which is also ideal for kids to undertake homework, while the parents prepare food. One of the nicest and most well designed features of this abode is its maximisation of natural light. As dark dwellings can feel uninviting and dank, this residence has combatted that by ensuring there are plenty of large glazed walls and open, bright rooms. 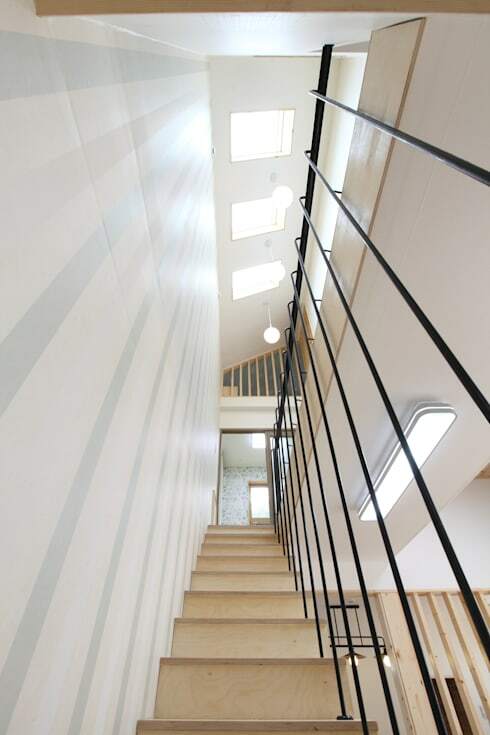 Here we wander upstairs via the eye-catching staircase. 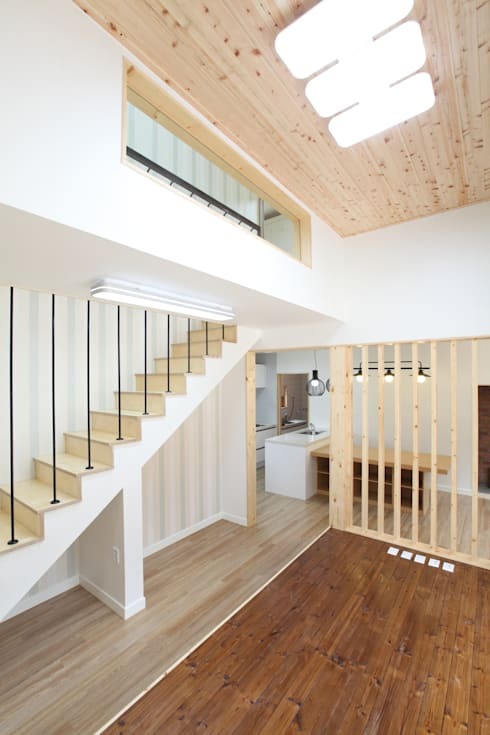 We can see the extensive use of roof lights, which bring ample light into every corner and nook in the home. Often, poorly-built dwellings neglect their internal spaces, wasting the overall floor plan and layout, leading to a lack of cohesion, and a generally inefficient abode. However, in this instance the dwelling has been designed to maximise its available space, ensuring every centimetre is accounted for. Upstairs we can see this space utilisation in full. Blank walls offer desk space, and others provide neat bookshelves with ideal areas for storage of books, and additional living appurtenances. Finally, we head upstairs to take a peek at the attic. Generally attics are a cold and unwelcoming space used to store household miscellany, but this one has been provided a better use! Replete with a large open space, this room is an area for the children of the house to play, relax and socialise with their friends. 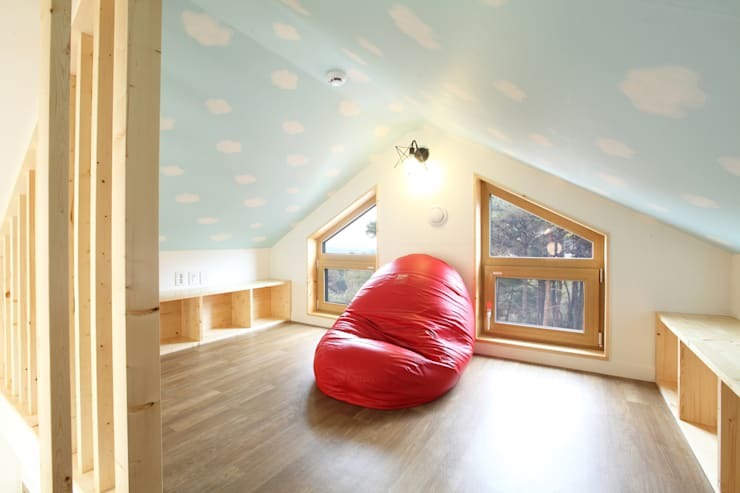 A cloudy sky motif adorns the ceiling, while built-in shelving is added to each side of the area for toys, books and other accessories. This home redefines what contemporary properties should be. It is stylish, full of necessary amenities, while still appreciating and celebrating traditional methods and styles of construction. 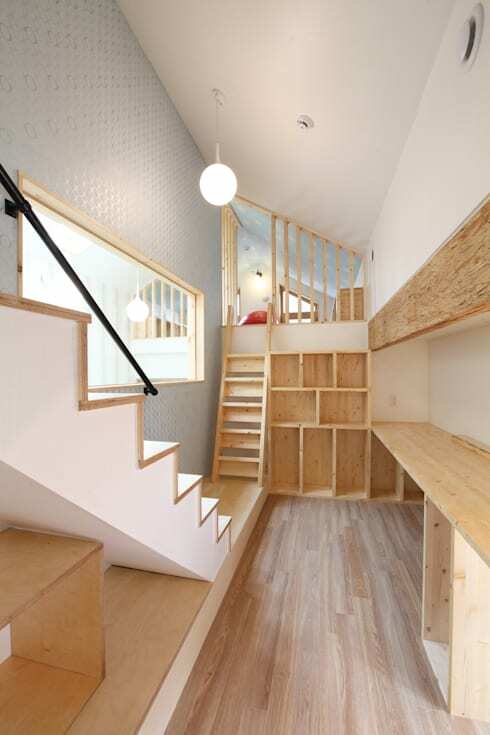 What did you think of this South Korean family abode? We'd love to hear from you in the comments below!